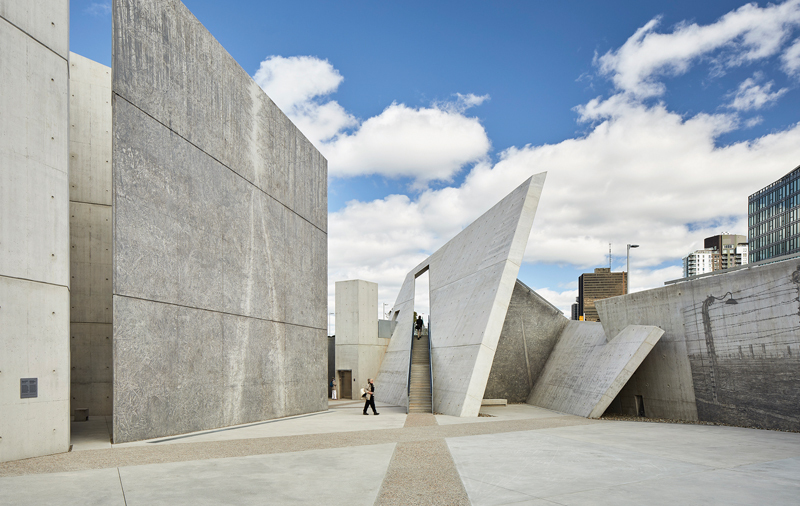 Opened in 2017, the National Holocaust Memorial in Ottawa is designed by Daniel Libeskind and includes photo-real images by Edward Burtynsky. Photo by Doublespace Photography. “In a city of monuments that rise,” wrote Yale University student Maya Lin in 1981 of her Vietnam Memorial design, “this will be a memorial that recedes.” Since her minimal composition was realized, architects have struggled to advance memorial design through similar abstraction. During this same recent period, following the example set by Guggenheim Bilbao, every aspiring world city seeks to lay claim to a work by a globally famous architect. The two trends occasionally coincide in a single work, as they do in Daniel Libeskind’s National Holocaust Monument in Ottawa. Libeskind’s project, located on unceded ground at the intersection of Wellington and Booth streets, is indeed monumental. Its concrete walls rise in powerful canted planes, enclosing a set of unroofed spaces with acute angles that, seen from above, resemble a Jewish star. In many ways, the monument reprises the design vocabulary of Libeskind’s Jewish Museum in Berlin, a significant work in which the geometries are linked to street addresses of key Jewish and non-Jewish Berliners. In the Ottawa monument, assigned messages have overwritten the actual site’s invisible and meaningful pasts—its almost ageless Indigenous history, and the more recently razed neighborhood known as LeBreton Flats. Those who write about this monument tend to enumerate its symbolic moments: the tilting walls signify oppression, the flame signifies remembrance, the staircase signifies hope. This kind of willful narrative has become all too familiar in how the public “learns” contemporary architecture. Constructions that are intended to keep memory alive didactically teach us what to think, and even what to feel. They have become their own kind of propaganda. In counterpoint to the symbolic components of the architectural design are six photographic images by Edward Burtynsky, each featuring a specific Holocaust site. Transferred to the concrete walls in specially formulated paint and exquisite detail, the images introduce a haunting immediacy. Though large, the images are not monumental. Instead, they relieve the stone surfaces of their abstraction. One wonders if these images—instead of being painted on specially constructed walls—might have been introduced almost randomly around the city, to more effectively remind us of other places, and other times. In 1944, before the end of World War II, art historian Kenneth Reid penned a short piece titled “Memorials? Yes!—but no monuments!” He concluded his attack on monument-building by writing: “But let us not again clutter up our villages and towns and cities with the sort of mediocre and even tawdry ‘monumental’ monstrosities that have been left in the wake of all our earlier wars.” Both then and now, it is not the talented sculptors and architects of these contemporary works who are to blame; they are practicing their craft. Instead, it is a matter of urban policies and their makers, who wilfully decide priorities, and assign hierarchies to the spaces of our public realm. In 1989, I visited all six of the sites of the Nazi extermination camps. Their expressions of memory span an architectural spectrum—from the chilling preservation of the camp and extermination buildings of Auschwitz-Birkenau to the contemplative stone-studded fields of Treblinka. None of these, as least in any obvious way, bore a prominent architect’s name. Indexed directly to their respective sites of trauma, each memorial’s “authorship” is history itself, edited perhaps, but not overtaken by symbol. How might this have been possible on the unceded land of LeBreton Flats? Might it be still? Jill Stoner is Director of the Azreili School of Architecture and Urbanism at Carleton University.